We made these paintings/canvases together a couple years ago... yes years. So, yah, it's about time. They were surprisingly easy and we both loved the results! And can I just say they are super durable. I think mine have been knocked off the wall more times than I can count (thanks to a little boy who likes to climb on the back of the couch) and they're still fine! Honestly I get asked about them ALL the time! (almost as much as people ask me what color I painted my walls. So here's a closer look at the canvases. The ones that I did anyway (this is Emily just so you know). 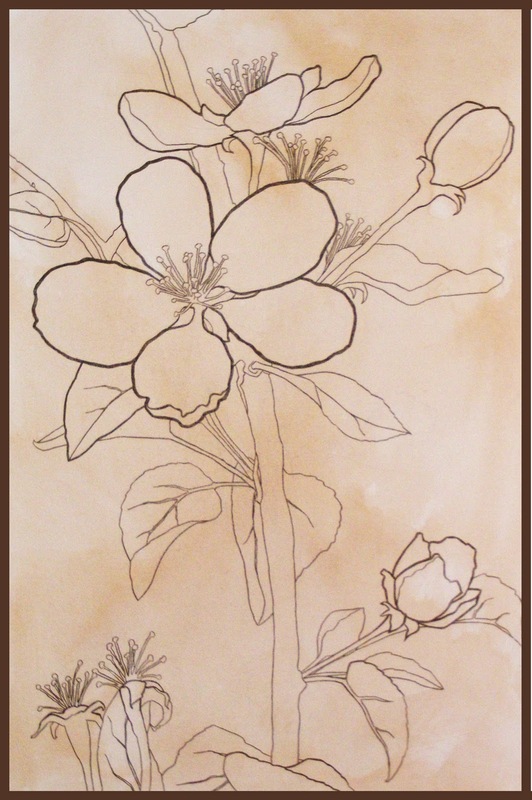 I used some photos I had taken of apple blossoms as references. 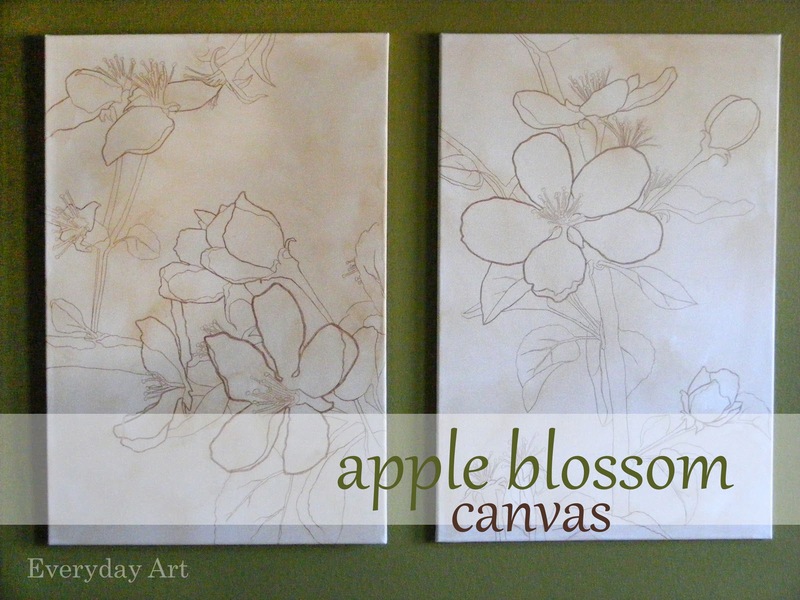 1- Start with your canvas, whatever size you like. and go ahead and buy the cheep kind, they should work fine. We just used regular acrylic paint from the craft store. I chose a dark paint because I knew I would be thinning it. Water the paint down until it looks like you're going to paint with watercolors. Then just brush the paint on the canvas. Add more where you want the color to be darker, use less or add plain water where you want it lighter. I used a large brush, but you could use a sponge or cloth or whatever makes you happy. Jaime left her paint a little bit thicker than mine and pulled vertical strokes down the canvas which looked great too. Just don't stress out and over work it. Put the paint on. Imperfect is perfect. 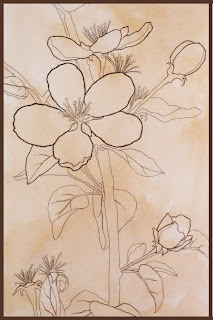 I used photos I had, like this..
then I just arranged the flowers the way I wanted and drew them on with pencil, LIGHTLY. If you don't have your own refernce, just find one you like on the internet, or on a piece of fabric, a t-shirt, look around. 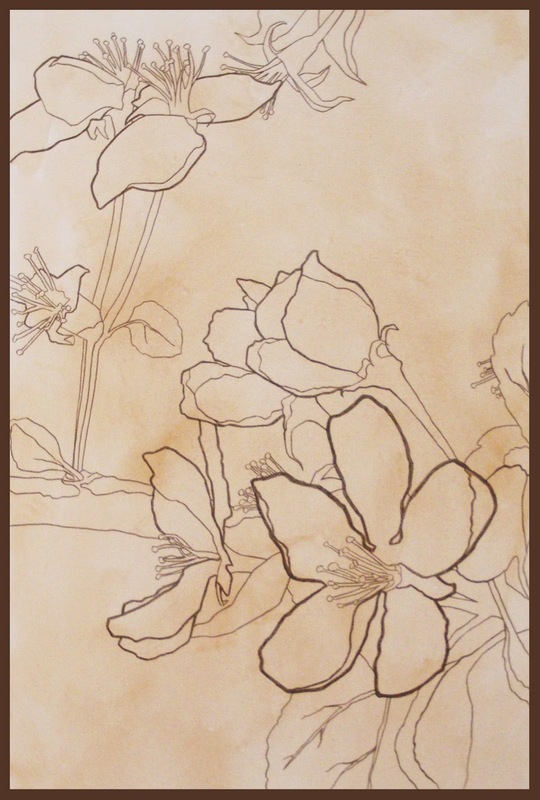 Also, if you are making a smaller picture, you can take your printed design on the back and hold it agains a bright window (or a light table) and trace. Trace over your pencil lines with an ACID FREE marker. DO NOT use permanent sharpie! The acid will discolor and burn through your canvas. Your best selection for markers will probably be with the scrapbooking supplies. *Add interest to your deisign by using thick and thin lines. What you want to be the focus, or what would be closest to the viewer (if you were looking at the object in real life) should be bolder! use an acrylic spray matte finish to seal your painting and prevent damage. I didn't but think I should have. Enjoy your lovely, new, and inexpensive artwork! I love your canvas, it looks great!